Our best offer! Venicci Grey Diamond Sparkle with Chrome Silver Chassis! 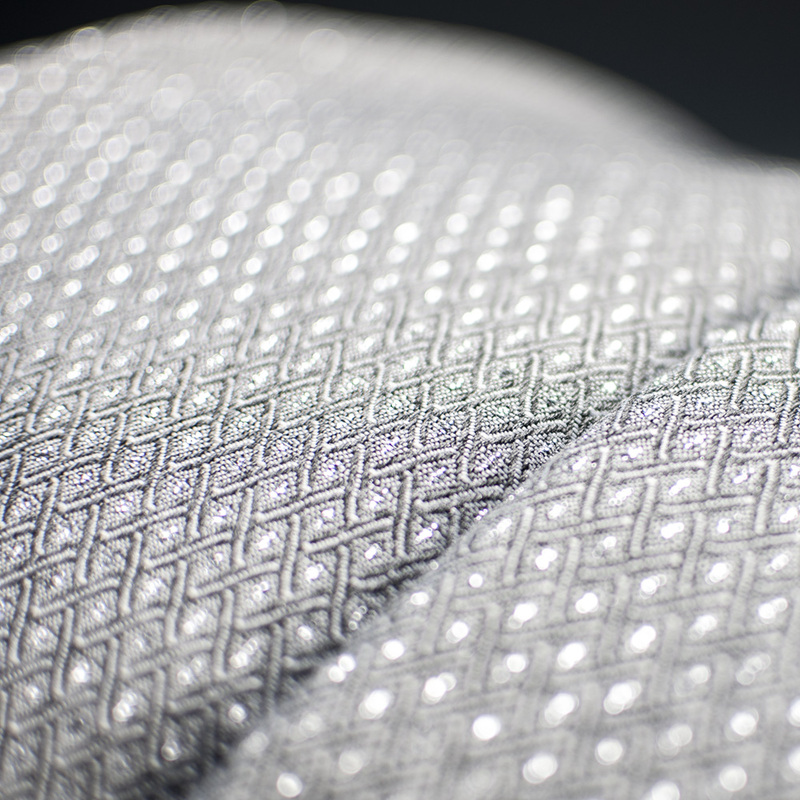 New & Exclusive to affordable baby – The soft grey fabric has a Silver Glitter Sparkle woven in the centre of the diamond shape pattern running through out, and when the light catches it, it’s truly stunning. The Venicci Grey Diamond Sparkle is truly stunning! Latest design & Exclusive to affordable baby. Package includes Pushchair, Carrycot, Car Seat, and Adapters, Matching Bag, Apron, Raincover, Cup holder, and insect net. 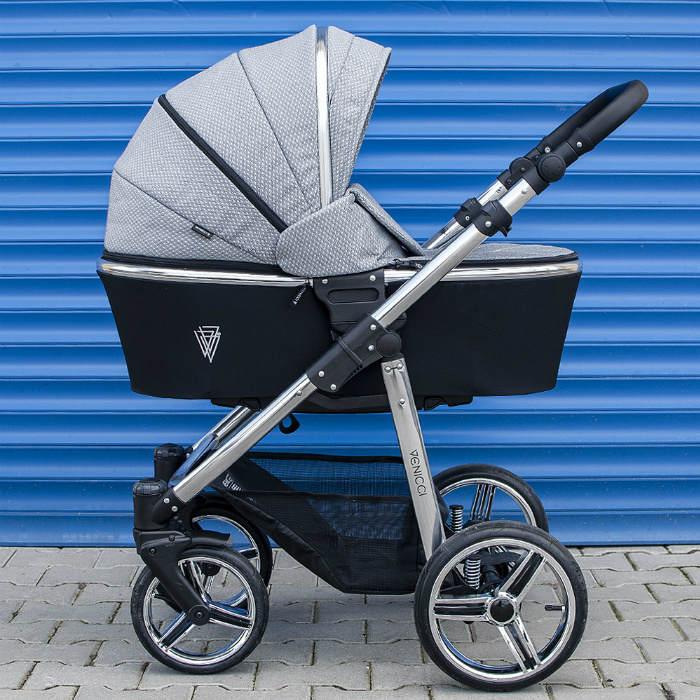 The Diamond shapes in the grey fabric create a sparkle and shimmer in daylight / bright light which makes the Venicci Sparkle Pram so on trend. 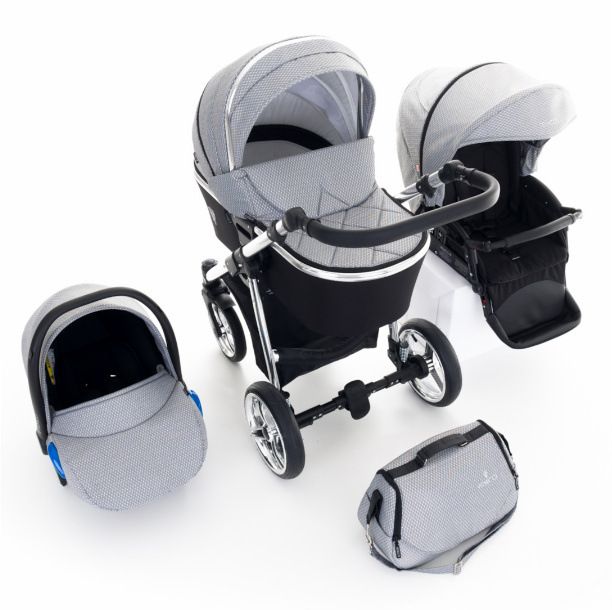 The large spacious carrycot is suitable from birth to 6 months plus. The mattress is included the carry cot and the lining is a luxury soft cotton. The Venicci fabric is UPF 50+ fabric so it will protect your baby from the elements! 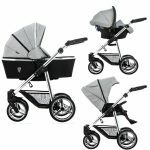 The carrycot also allows you to sit baby up in three positions, therefore, the carrycot will last baby longer than a traditional lie flat carrycot. 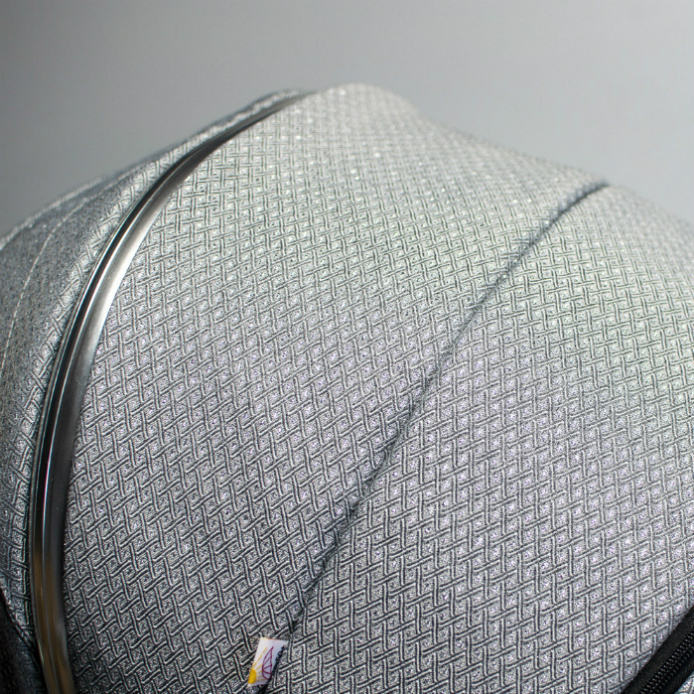 For summer there is also a large vent to vent through the carrycot and keep baby cool. 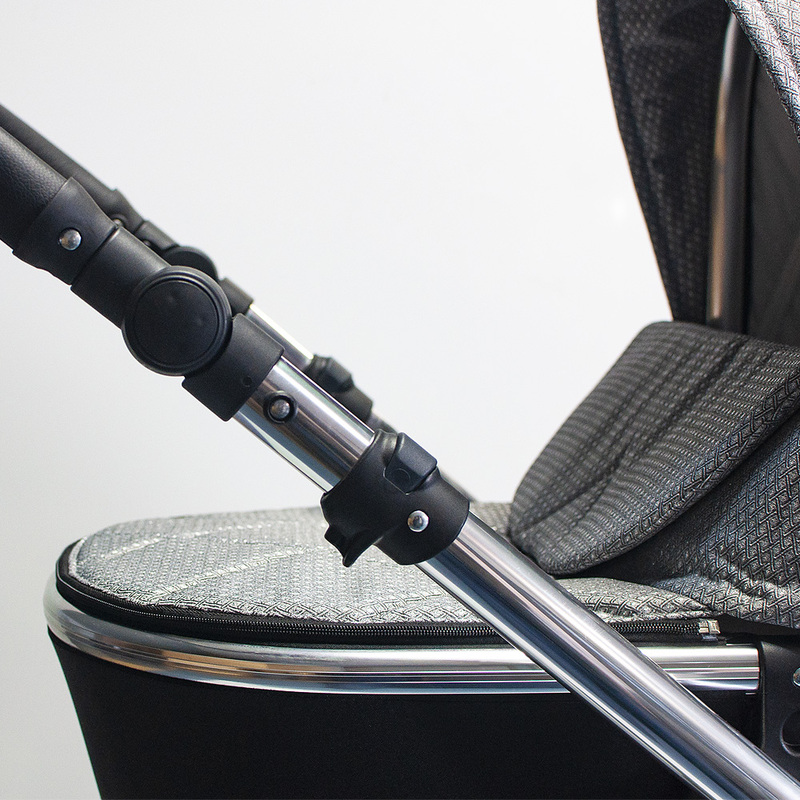 The carrycot uses an easy click system where you just click it on and off and lift using the carrycot handle. 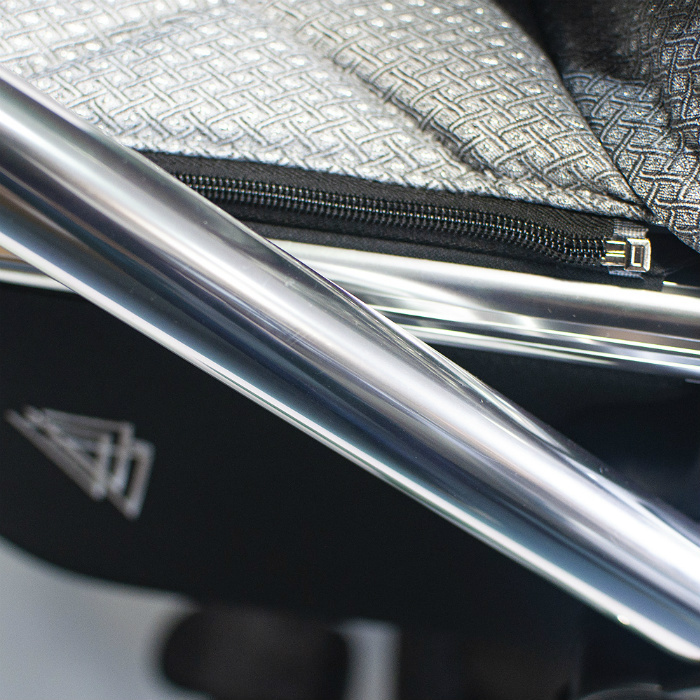 The Carrycot apron has the same Diamond Sparkle fabrics found throughout the bag the car seat and the seat unit. The pushchair comes complete with leatherette bumper bar, hood and apron and is suitable from 6-36 months. 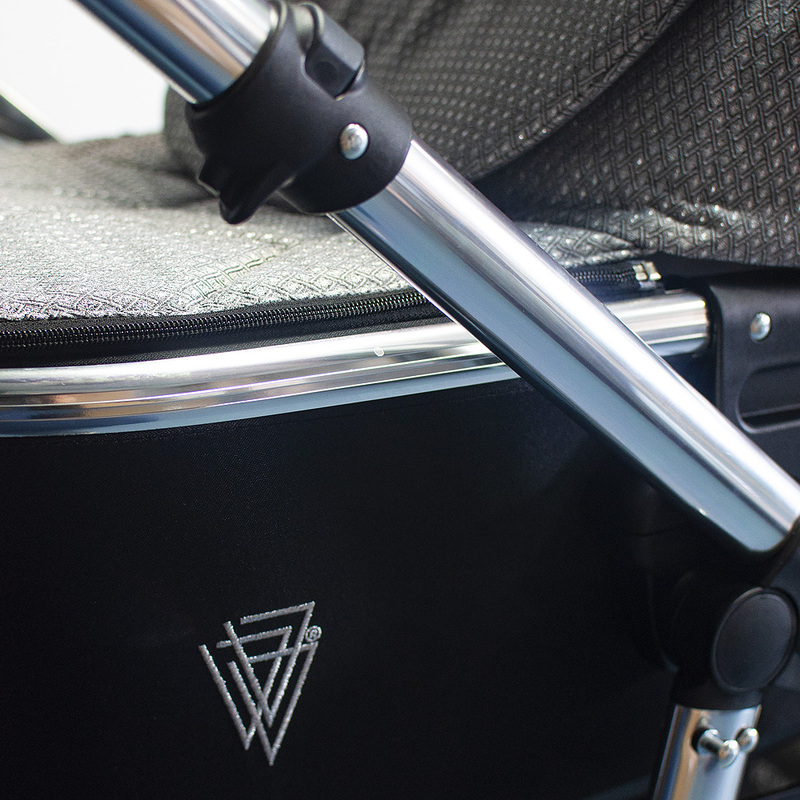 You can be safe in the knowledge your baby is secure with the 5 point safety harness on the Venicci Sparkle Pram which is height adjustable and also has pushchair has a liner to keep your pushchair clean and it is nice and padded for babies comfort. 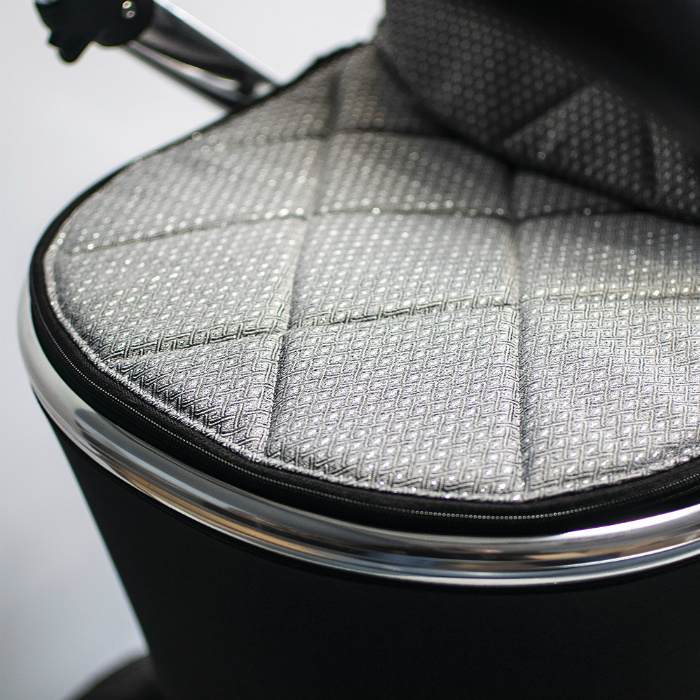 The backrest is a multi recline backrest and has three positions. 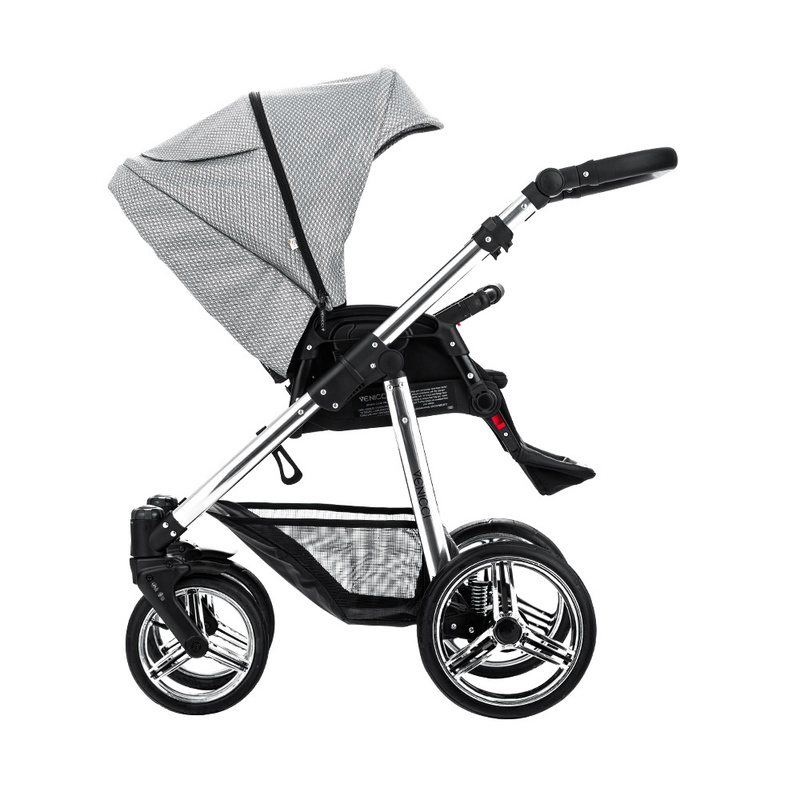 There is also a summer vent you can open and also the hood on the pushchair extends to shade baby from the sun or if they have gone to sleep. Car Seat is suitable from birth -13kgs and features car seat adapters to fix your seat to the chassis. Really nice pram. Took my newborn granddaughter out for a walk in her new pram and it was really light to push . My son said it is very easy to adapt with the car seat too. The sun was shining and it sparkled in the sunshine. 2 lovely comments from passers by re baby and pram. The only thing was we couldn’t work out how the insect net fits on ? Otherwise son and partener very pleased with purchase. Grandma too ! 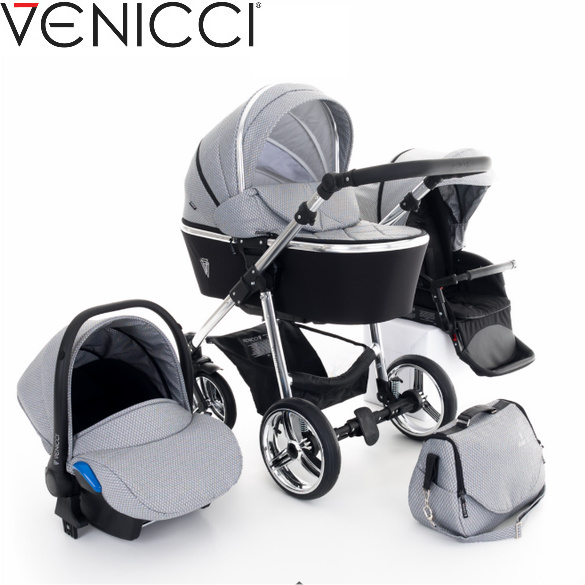 Introducing the New Venicci Silver Spark Travel System! This Pram is brand new for 2018! 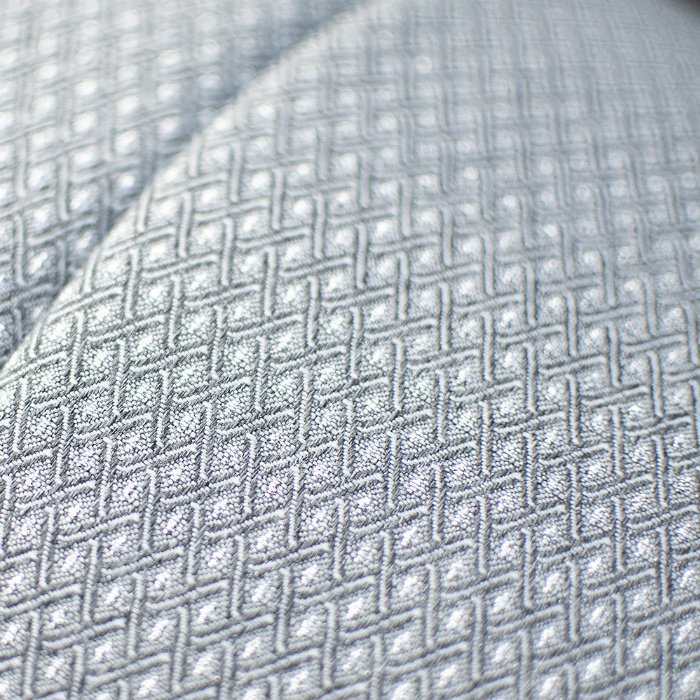 The fabric has a Sparkle running through out and when the light catches it its truly stunning. 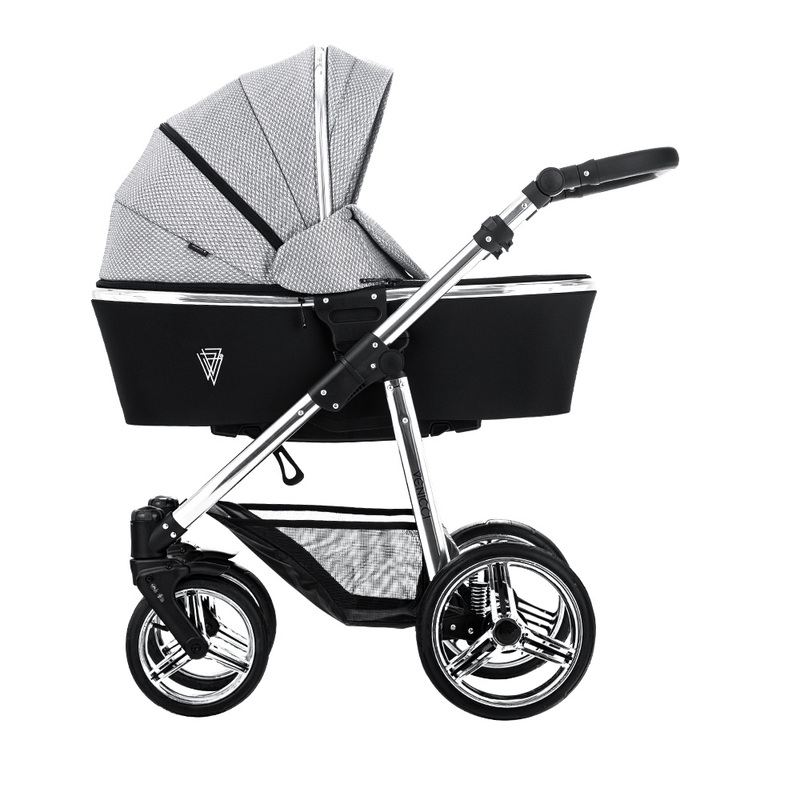 The elegant special edition Venicci travel system combines versatility, elegance and contemporary European style to bring you and your family a pram and pushchair designed to last over the years. 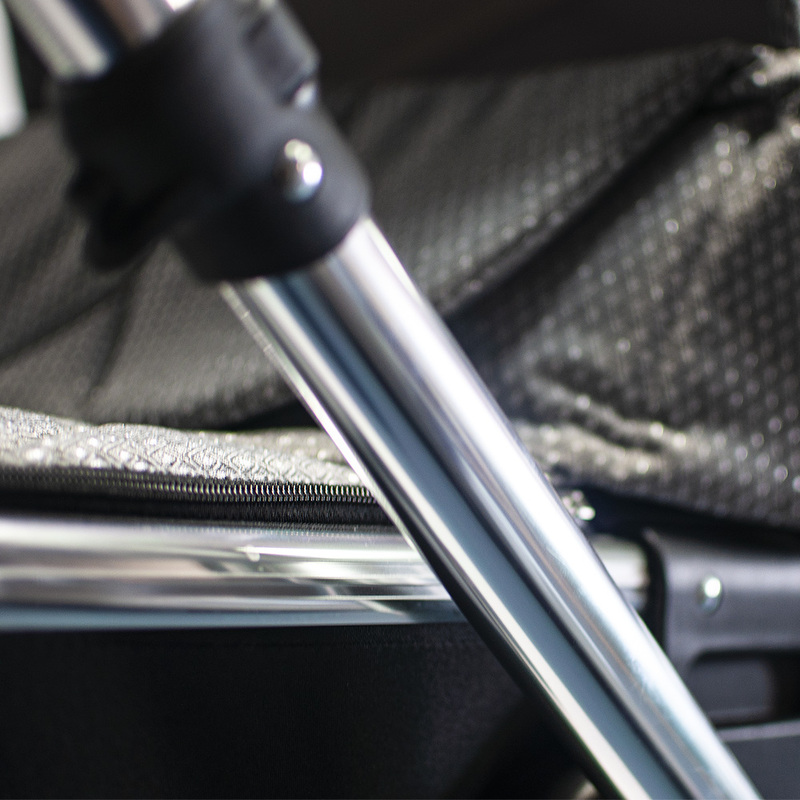 This package includes special edition White Chassis, Quilted Leatherette carrycot with advanced ventilation, seat unit, car seat, bumper bar, seat apron, mosquito net, changing bag, raincover, and cup holder. 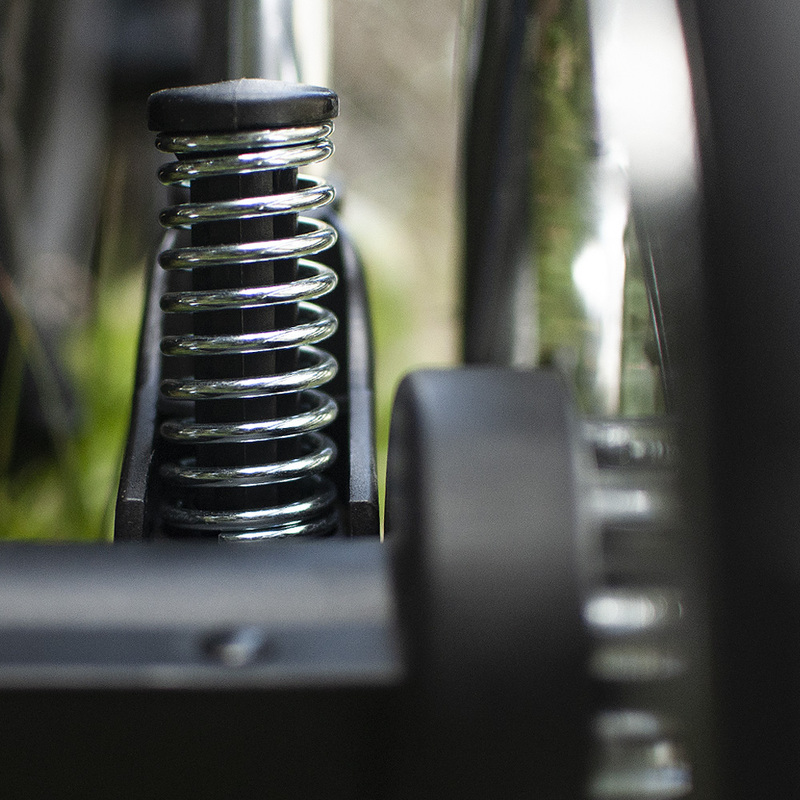 Updated for 2017 the latest Venicci Isofix / Non Isofix Base. Fits Venicci car seats only. 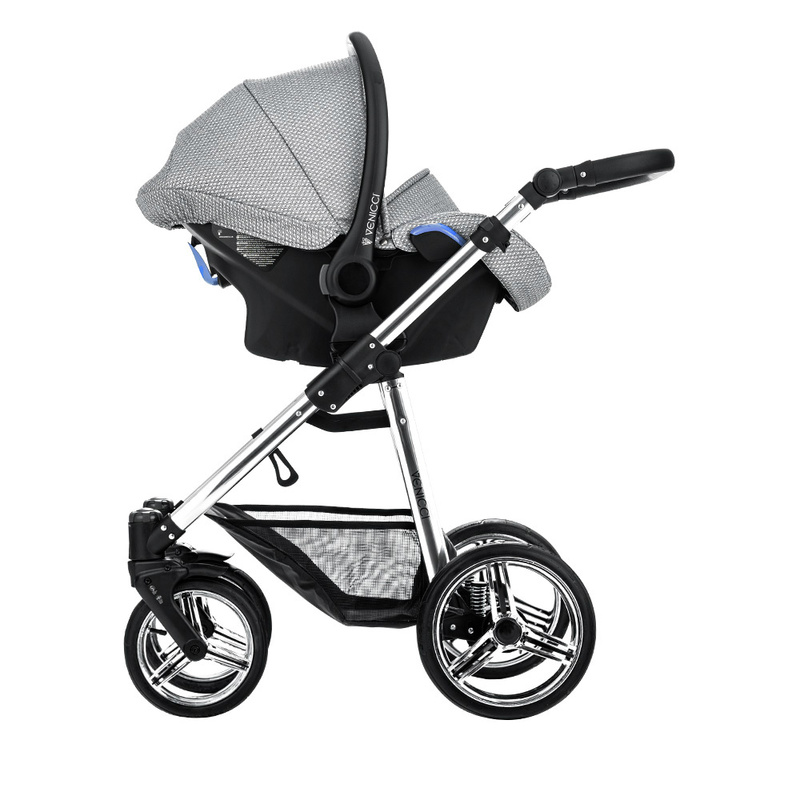 Introducing the New Venicci Carbo Black Travel System! This Pram is brand new for 2018! 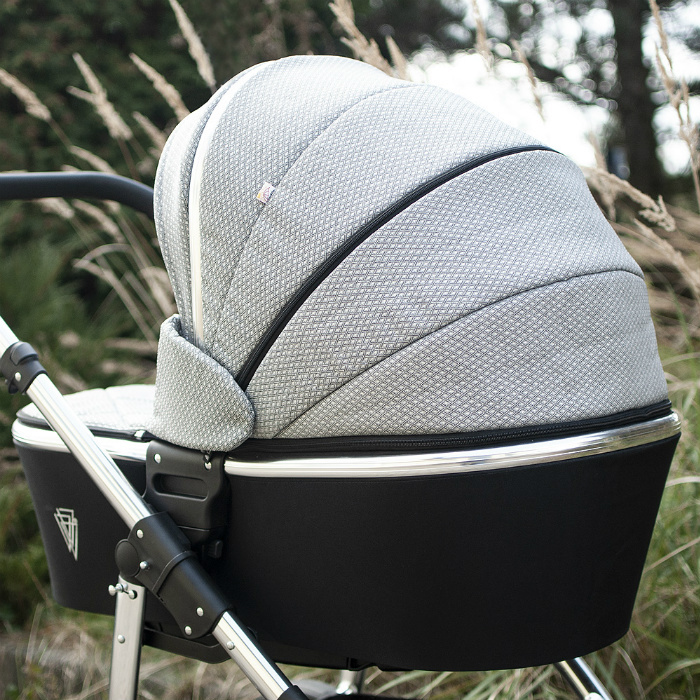 The Pram features a gorgeous grey leatherette quilted bottom.